New E12J Jumeau Available For Purchase! Welcome back to Land of Oz Dolls! I would love to share with you tonight my newest E12J Jumeau. She stands 21″ tall and is now available for purchase. She has such personality and is one of my favorite Jumeau’s. This Doll Has Been Sold! New 17″ Bru Jne 8 For Sale! Welcome back to Land of Oz Dolls! Newly Listed On My Website! I just wanted to share another beautiful Bru with you. This one is the Bru Jne 8. 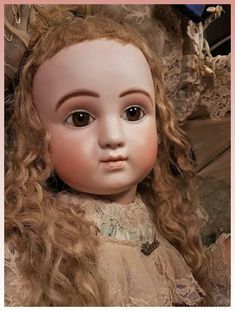 She is 17″ tall (doll only) about 18 1/2″ tall when you allow for the doll stand and bonnet. Bru’s are one of my favorite dolls to paint. I have never met a Bru I haven’t absolutely loved. See below for a more complete description of this doll and more photos along with the shopping cart button. 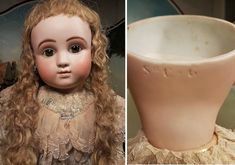 She is being sold as a dressed doll only. 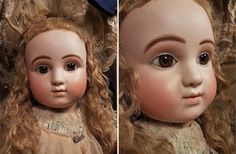 This gorgeous, museum quality 17″ Bru 8 antique reproduction porcelain doll was lovingly created by “Millie” winning, world renowned artist, Connie Zink of Land of Oz Dolls. She was made from the VL-27 Bru Jne 8 Virginia LaVorgna head mold. This doll is perfection at its best. Her porcelain head is on a FB14S composition body from New York Doll Products. 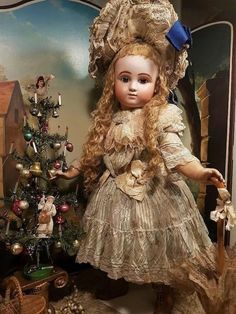 She stands 18 1/2″ tall on her wooden base doll stand. 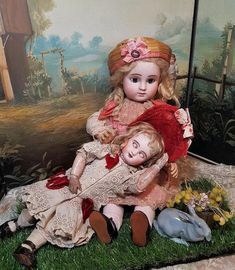 (Allow height on shelf for stand and hat, doll alone is 17″ tall). The wooden base doll stand is included. She has beautiful light blue Schoepfer paperweight eyes with intense depth, the photos just do not do the eyes justice. She has a striking vintage new (never used) old store stock Cheveux French Human Hair wig from the late 1980’s . The costume is made from a beautiful shade of purple “raw” silk. The dress with antique lace trim and a bonnet was created by Pam Willits. She also has a beige cotton slip and underwear, along with cream hand made leather shoes and hand crocheted cotton stockings. Layaways are available. For dolls that you cannot purchase outright, please contact me and I’ll try to make the purchase possible for you through layaway. My email is landofozdolls@mchsi.com or you may call me at 815-565-0024. Until next time! Have a great dolly day! Welcome back to Land of Oz Dolls! It seems so long ago I stopped by with any news here at the shop. I have an exciting announcement of my latest creation along with some photos to share with you. Now that summer is over and the hot weather is gone, I am back in the studio creating some new dolls. I also have started my newest session of Online Doll-making Classes. I am currently redoing my Bru course. If anyone would like more info on the course please contact me at 815-565-0024 or email landofozdolls@mchsi.com and I can give you more details. Now all about the new Bru that has been listed for sale here on my website and on eBay. I am really excited about this one I think she turned out absolutely beautiful.